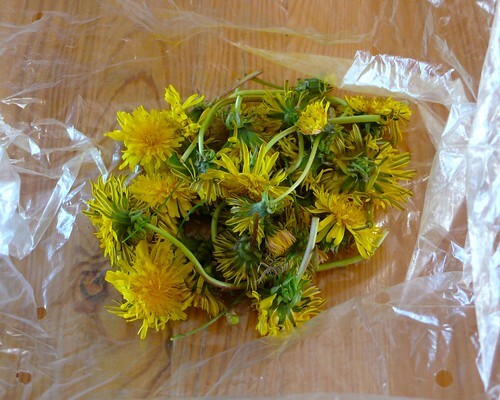 Most people think dent-de-lion (aka dandelions) is just some weedy plant that are blithe to their gardens. Our land lord certainly think so for he gave us three bottles of dandelion killers. They used to be under the stairs, but I moved them to the annex (yes we have an annex!). My sister in law gave me a Irish cook book when we moved here. The book had all sorts of recipes Irish. I was particular drawn to dandelions. I didn’t know they were editable! Apparently the leaves can be used for salad and flowers can be eaten. I was fascinated by the fried flower recipe. Any recipe with the word ‘FRIED’ is by default is delicious in my book! So today we went out to gather dandelions. I wonder if our neighbors think we are insane! Surprisingly it was hard to find. I guess people really hate them! Anyway, feast your eyes on these wonderful dent-de-lions! Mr said they taste like bland fried vegetable. I will have to tweak the recipe next time to see if I should change the herbs or more salt. It smelled delicious as I was cooking them! Rinse the flowers and dry them gently. I left them on a plate on top of some paper towels. Mix the flour, salt, black pepper, dried thyme, and dried oregano. Heat frying pan over medium heat with the vegetable oil. You don’t need that much just enough to cover the flowers. 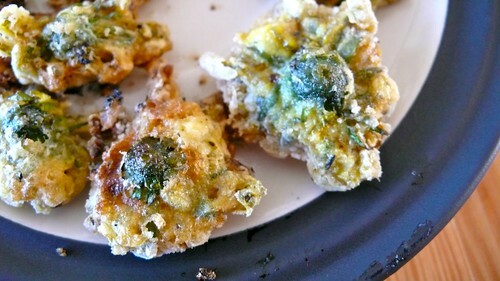 Dip the flower in the beaten egg and then in the seasoned flour mixture. Fry the little flowers in batches, stalk side up until golden. You really want to cut as much as stalk off as possible without breaking up the flower. It’s pretty tricky, but if you cut too deep you just end up with petals. It’s kind of cool but hard to fry.